Engineering News-Record (ENR) MidAtlantic recently announced its 2015 Best Projects competition winners which honors the top projects in Delaware, Maryland, Pennsylvania, Virginia, West Virginia and DC. The Turkish American Community Center (TACC) – was awarded Best Project in the Cultural/Worship category. Balfour Beatty served as TACC’s prime contractor for the design-build project. 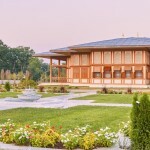 Located on 15 acres of land in Lanham, Md., TACC consists of five buildings – a mosque, Turkish bath and fitness center, fellowship hall, cultural center with performance hall, and a convent/monastery. The Fellowship Hall includes approximately 12,000 square feet of finished space with ornamental wood ceiling panels, stained glass windows, and wood millwork imported from Turkey. The building serves as the main reception hall for the campus and includes a full commercial kitchen. TACC consists of five buildings – a mosque, Turkish bath and fitness center, fellowship hall, cultural center with performance hall, and a convent/monastery. The project was designed to create a campus for the Turkish American Community Center to share their values and culture with the local community. The Cultural Center includes approximately 25,000 square feet of finishes space with interior stone work, a 40-foot skylight, offices, and a 200-seat performance hall. The Mosque is a 12,000-square-foot main hall with an 80-foot-high concrete dome and accommodates 760 people. It is a monumental structure which can be seen from quite a distance in a predominately residential neighborhood. The white limestone and marble exterior shines brightly during the day and glows in the night with lights highlighting its many ornate features. The building allows the celebration of the Muslim faith and is the focal point of the project. The Turkish Bath is a 60,000-square-foot athletic and bathing facility, including an underground gym space, indoor pool, fitness center and Turkish Sauna. The Fellowship Hall is for receptions and large gatherings with ornamental millwork on every wall and ceiling. The marble floors provide a beautiful and sturdy surface for even the most boisterous events. The performance hall includes a high-end sound system, translator booths with wireless translation headsets, stage lighting, and projector system. 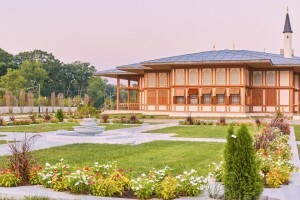 The Convent Monastery is a 40,000-square-foot, apartment-style building intended for Turkish visitors and includes 17 living units with hardwood floors, Turkish-tiled bathrooms, and ground floor meeting spaces. The project also includes a 150,000-square-foot underground parking garage covered by unit paver walkways and landscaping. The attention to detail in the finishes of the buildings showcase Turkish culture and help develop curiosity in the local community. The final product excellently serves the Turkish American Community Center’s goals of a place to provide both activity and education to the local community. Allen & Shariff Engineering provided MEP Design/Engineering for this project.